Impressive list of features! I have one on order for 80m. 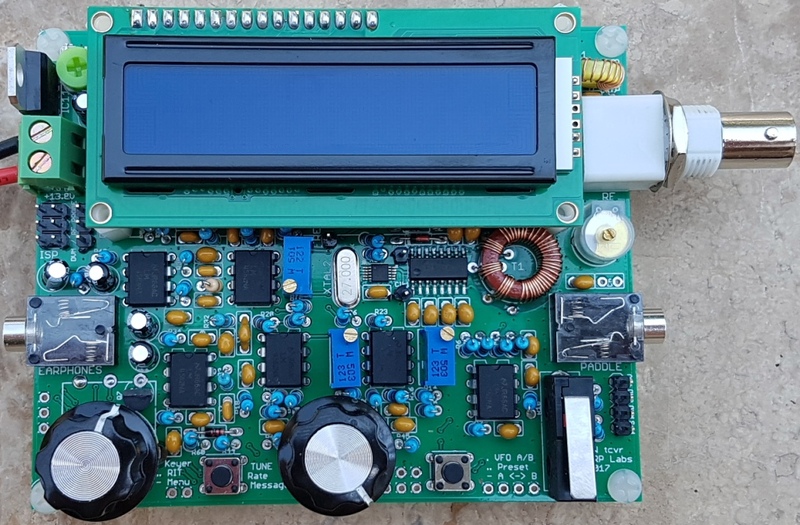 Re: New QRP Labs 5W CW Transceiver Kit. NICE! Thanks for posting that. I just ordered one, also in 80M. It was $55.30 shipped. I don't know how they make any money with the prices they charge. Shipping was cheap enough that I assume they are in the U.S., but I can't find where they are located. This will be a nice fall project. Naturally I'll design a 3-D printed box and make a few available for members here that have been around a while. Awesome Bob. By the way I have made the Nescaf filter, and the video is set aside for when I won't have anything to post on Youtube. The only issue with this new kit is having to cut a rectangle window in an aluminum case... Oh well... Other than that it's great! Looks like I have serial #254. … I assume they are in the U.S., but I can't find where they are located. As a 2009 QRP ARCI Hall of Fame inductee - Hans Summers, G0UPL, is an electronic experimenter and amateur radio innovator extraordinaire. Hans pays careful attention to compact and minimal parts count to achieve the design goals of his homebrew projects. Hans is the owner of QRP Labs joins Eric, 4Z1UG, in a conversation about QRSS slow data transmissions, high altitude balloon transmitters, and shares his ham radio and electronic builder story. Edit: I removed his complete home address, found on QRZ.com. All other information is publicly available. Gil, I can't wait to hear what you think of the filter. I built my filter and Pico-Keyer and but haven't quite finished the box to put them in, so I haven't tried the filter yet. Sparks, thanks for the background on qrp-labs.com. I got the sense they were from across the big pond, which makes the low shipping cost impressive. I've been looking at this QRP Labs kit all week and finally decided to order a 20 meter version. It looks pretty complex for the price. Now I will have to brush up on my CW skills. I hope somebody makes a after market case for it, I bet they do. Thanks Gil! So great and useful to be on RadioPreppers.com! I bit the bullet immediately, as need at least ONE QRP rig sooner than later, while I dilly and dally and save up for e.g. PFR-3b. I ordered one for 30m. Impressive that it has a CW decoder built in, not much use if you cannot send CW, but useful perhaps for when you are sleeping and someone else is keeping watch on frequency. Nice that it has, presumably also beacon mode, for auto CQ. I chose 30m due to all-round propagation: possible for DX every day (or night) but also good regional coverage. In higher latitudes not as useful as 40m, and not nearly as many stations available as on 40m, but, I like the DX. Noise levels there during TWAWKI are also much lower. But for portable use and TEOTWAWKI probably 40m would have been much more useful. One can always order another one hopefully, later, always good to have 2 different rigs in case one breaks. Shipping is from China. If they smuggle them across to Laos it'd be even cheaper! I'll report my number when known so we can see how fast they are going, I bet fast. Good voltage range 8-14V wonder if 8V really produces 3W and how much 12V produces. 200Hz CW filter with no ringing sounds good, though hopefully it also allows filter to be off/wide? Got my serial number, it is over 600! "your order is a PRE-order for a kit from the second batch of 500, which is expected mid-September." Unsurprisingly this is popular. Unsurprisingly many found out about it before we did, but I'd not have known if not for RadioPreppers.com! I ordered mine a few days ago and it's serial number 301. I just checked their website and to they just shipped #175. Looks like I got in just before a big run on them. Mine is number 628. Also, I believe Hans ships from Japan.